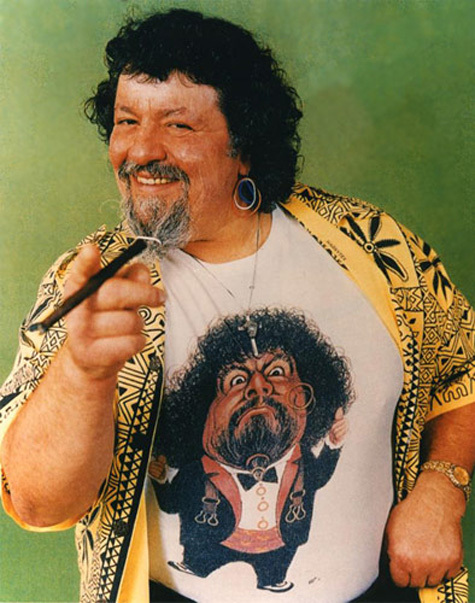 If I knew what a shaggy dog story was, I would say that the life and career of Captain Lou Albano is one such story. Since I don’t have the slightest clue as to what a shaggy dog story is, I’ll have to come up with something else. So what is the story of the Captain? Is it a fairy tale? A whodunnit? A modernist work with themes of alienation? It’s certainly not a knock-knock joke, but what else could it be? 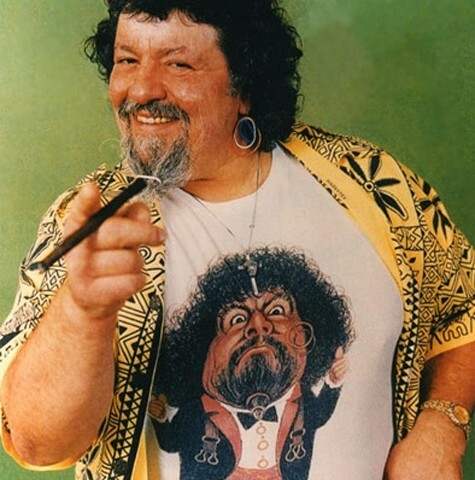 For over 50 years, the Captain has entertained us, starting in the world of professional wrestling as both athlete and manager (he was recently inducted into the WWE hall of fame) and eventually beginning an eclectic yet prolific acting career. He had a notable role in Brian DePalma’s Wiseguys, a small appearance in an episode of Miami Vice and can even be seen in Cyndi Lauper’s music video for Girls Just Wanna Have Fun. But if you are a child of the 80s, you probably remember him best as the bumbling Italian-American plumber, Mario, in the 1989 TV series The Super Mario Bros. Super Show, which comes out on a four disc DVD set this March. I caught up with him one Friday morning while he was trying to catch a plane. SLUG: What did you enjoy more, wrestling or being behind the scenes, managing? CLA: Well I enjoyed like, Wiseguys, the movie Wiseguys with Danny DeVito and Joe Piscopo. And I also enjoyed the wrestling. SLUG: Alright….did working in wrestling provide good opportunities to break into other areas of the entertainment industry? CLA: Yes it did, 50 years in wrestling, I mean it gave a lot of, a lot of chances. SLUG: Show business has a tendency to kind of chew you up and spit you out, how do you manage throughout that, how do you stay on top? CLA: Well I’ve stayed wrestling for 50 years, 53 years, and in the mean time I did my Super Mario, uh, who wants to be what do you call them… millionaires. Cyndi Lauper, Girls Wanna Have Fun, so I’ve done a lot of stuff right along and it just fit right in. SLUG: How did you get involved with Cyndi Lauper? CLA: She was down in queens when she was a young girl, she was after me many times, “Would you wanna be in Girls Wanna Have Fun?” and so forth and I turned around, and they all thought it was my manager, which it wasn’t. But hey, Girls Wanna Have Fun, I did it and that was it. SLUG: So your business relationship kinda ended there? CLA: Yea right there. And we’re still friends, I talked to her about a month ago or so. SLUG: So how did you make the transition from wrestling to acting? CLA: Well its part of wrestling that becomes the showmanship, and uh, it went in from one to the other. I just stayed right with it and enjoyed it. SLUG: So how did you get the role for Mario, specifically? CLA: Yea that was just a…a what do you call it, which is now gonna be a big, big thing, and it’s gonna be a complete uh, what looks like a success, I hope to God. And Super Mario was a (high pitched squealing noise) bambino, with a little guy with no beard, I shaved the beard and so forth and I played Mario. SLUG: Were you happy when it was all over with to grow your trademark beard again? CLA: Really um, either way (laughs) as long as I made a few bucks it was fine. SLUG: It’s a cool DVD, have you had a chance to watch it yet? CLA: Yes I have, its gonna be real, real big. SLUG: Yea. Did you do any writing for the show? CLA: Uh no, I just uh, put some answers in there, and some questions in, but I didn’t actually write for the show. SLUG: It’s kind of a wild show, did you do any improv? CLA: Uh yea, different things and all, you know it was part of the show. CLA: Yea, it’s a funny thing. It went along for five years, and it was back off and now it looks like it’s gonna be a real, major, major event. SLUG: One of the great things about the show is the guest stars, like Magic Johnson. Of all of the guests you had on the show, who was your favorite? CLA: Well we had uh, Magic Johnson, there were so many I wouldn’t want to single one out. They were all, good, good celebrities. SLUG: On a scale from one to 10, 10 being high one being low, how would you rate your experience doing Super Mario Bros? CLA: I’d like it to be a 10. I love the Super Mario, I loved Wiseguys with Danny DeVito and Joe Piscapo and uh, Harvey Keitel and so forth, and uh, I enjoyed it. SLUG: So what’s next for the Captain, what can we look forward to? CLA: Next, Captain will be getting on a plane and shooting down to Florida. I’ve got some more events and a couple movies, which we’re not sure of, and we’ll be ready for that.